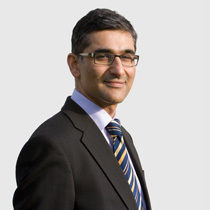 Junaid Hanif is a Consultant ENT Surgeon working at the Norfolk and Norwich University Hospital (Norwich). He is also an Honorary Senior Lecturer at UEA Medical School. His private practice is based at Spire Norwich Hospital. Rhinology (diseases of the nose and sinuses), Otology (diseases of the ear) and treatment of snoring and sleep related breathing disorders. 1 year of full-time research at the famous Common Cold Centre at Cardiff University. The research looked at aspects of nasal airflow and I was awarded a Master of Philosophy in Rhinology for my dissertation - Middle ear disease, chronic sinusitis and facial pain, complications of ear piercing, development of a computer modelled 'virtual ear' for training. Consultant ENT Surgeon at Norfolk & Norwich University Hospital and James Padget University Hospital. Mr Hanif is married with a young family. He and his wife share a passion for travel and have travelled extensively around the world. They are also passionate about reading literature. In the past he has held a full private pilot's licence and intends to start flying again soon. To keep healthy he plays squash and swims regularly.